Team Mexico accepting first place! There’s no other word for it; last night Mexico DOMINATED the World Cosplay Summit. Held in Nagoya, this annual event brings together the most elite cosplayers in the world for a competition to see who’s the best. This year, Mexico showed its fighting spirit (literally) with a Street Fighter cosplay and skit combo that knocked the judges out cold. 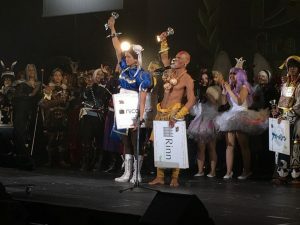 Out of nine awards given out last night, Mexico snagged SIX of them including the Air Asia award, the Futaba award, the NicoNico award, and the grand championship. Indonesia and Thailand took second and third place, respectively. This marks the second time that Mexico has won the grand championship (tying them with Japan). The last time this happened was in 2015. Currently, the overall leaders are Italy and Brazil, with three wins each. Congratulations to the winners and participants of this year’s competition!